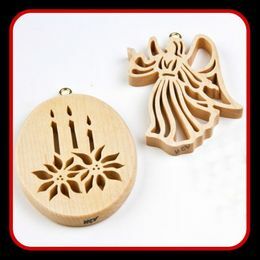 Over 500 hand cut ornament designs out of solid 5/16" thick rock maple. Each ornament is finished with a clear sealer and comes gift packaged with a brass hanger, suction cup, and story card describing how we make them! Average size is approximately 2 1/2". These are perfect for those names and nicknames that are hard to find or are spelled in a unique way. 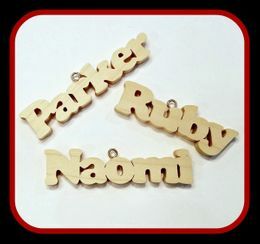 They are cut on a scroll saw, made from 5/16" solid rock maple, and have a clear satin finish. They can be used as tree ornaments, gift tags, hung on a suction cup, used for a special craft project, etc. 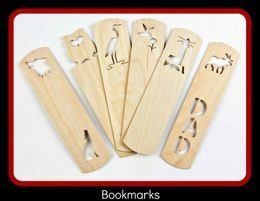 Each bookmark is cut from 1/16" birch plywood for strength and is approximately 5 1/2" long. These make great gifts for a classroom, book club, or to include in a greeting card. 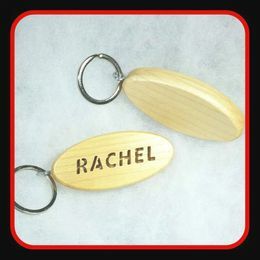 These custom cut key rings are made from solid maple. The top portion is cut, sanded, and then laminated to a solid bottom before finishing with a long-lasting urethane. We can cut up to 8 letters. They average 2 1/2" - 3" in length.